Posted in our sister blog, Todd Clarke’s Technology Corner, is an obituary of the man who developed the hardware for the first personal computer. His fulltime job was as a scientist at Sandia National Labratories, but his interests were in developing computers that the public could use. His company, MITS, developed the hardware, but he needed a software operating system to make the machine more accesible, and he and heard of a bright young programmer in the Seattle Area, Bill Gates, who might be able to write what he needed. Bill and his partner, Paul Allen worked around the clock from some down and out Route 66 motels to write the first operating system under their new corpoorate name, Microsoft. 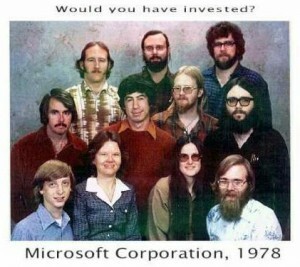 This corporate photo, taken in 1978, shows the original Microsoft staff. Thank you Dr. Edwards for cementing Albuquerque’s role in computer history.